Volume 10, DAVID BAKER. Intermediate/advanced level. This set is a sleeper! These songs are written by one of the finest jazz educators in the world. 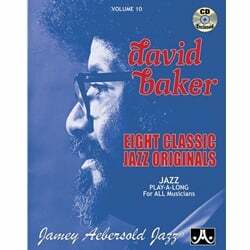 A pioneer in jazz pedagogy and a prolific writer, David Baker has written eight tunes which contain much variety. A wide variety of styles and tempos. The rhythm section really gets into each tune, which in turn, brings more out of you when you play. Songs are all truly performance level material, yet designed to specifically address the needs of the advancing improviser with different challenges in each; swing, rock, bossa, waltz, slow groove and ballad. Related publication: "Jazz Solos" by David Baker. Rhythm section is Dan Haerle, piano; Rufus Reid, bass; Jonathan Higgins or Charlie Craig, drums. Titles: Aulil, Black Thursday, LeRoi, Bossa Belle, Kentucky Oysters, Soleil d' Altamira, Passion, Le Miroir Noir.